Heath suffered what on the face of it was a surprise 27-14 defeat at Selby in Yorkshire One yesterday. However, the third-placed visitors had a much-changed side due to injuries and unavailabilities while lowly Selby, well beaten at Brods a week earlier, have reappointed Steve Cruise as head coach and got several players back from a higher level. Alex McFadden, Michael Reynolds, Chris Moore and Dave Skinner were among the Heath absentees, meaning starts for Peter Birkett, Mark Puttick, Chris Piper and Martyn Barnes. Heath began in confident mood as they kicked off with a strong wind at their backs and Selby struggled to adjust to the onslaught. A clever kick from Jack Crabtree set up a scoring opportunity for Cameron Ramsden and then Richard Brown went close. Ezra Hinchliffe, Olly Cook and Piper set up another chance and Peter Birkett was held up short after a jinking run. Selby defended with great determination and after 10 minutes broke free to set up their first attack, resulting in a converted try. Heath were soon level. Hinchliffe put in a superb kick and Jack Crabtree’s cross field punt was scooped up by Callum Harriett-Brown, who scored near the posts. Hinchliffe converted. Selby’s response was immediate, Heath missing several tackles as the hosts took a 14-7 lead with a well worked converted try on 22 minutes. The visitors were not functioning properly, the home side were growing in confidence and Heath lost Si Brown to the sin-bin. However, Crabtree was making full use of the conditions and the ball bobbled around from his clever kick, allowing Puttick to touch down in the corner. Hinchliffe added a touch line conversion and the scores were level again at 14-14 on 35 minutes. Harriett-Brown covered well before sending Hinchliffe on a weaving run from inside his own 22 to Selby’s 22 before he was bundled into touch. The second half began well for Heath with a charging run from Eddie Cartwright but the visitors were vulnerable to quick breaks. Selby kicked two penalties for a 20-14 lead after 55 minutes and Heath lost Crabtree to the sin-bin for a high tackle. 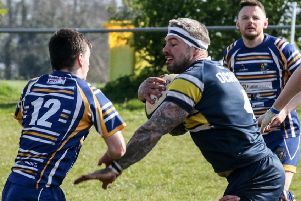 Selby moved clear with a converted try on the hour mark and Heath could not break down a resilient Selby defence despite their efforts of replacement Jordan Bradbrook and Hinchliffe. Richard Brown, Jack Crabtree and Bradbrook moved the ball around to take Heath close and Cartwright and Harriett-Brown linked well but Olly Wilby could not hold on to a poor pass as the try line beckoned.